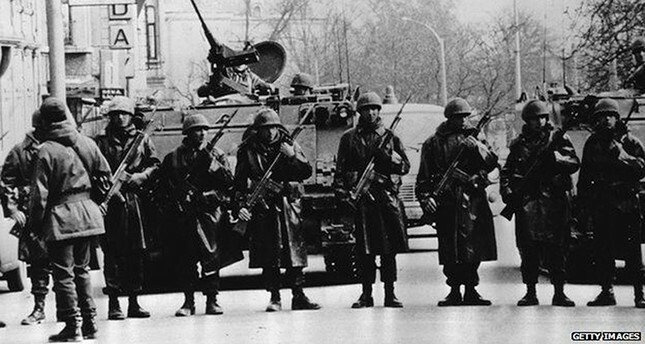 New information indicates that following Turkey's 1980 military coup – orchestrated by Chief of Staff Gen. Kenan Evren – the then-U.S. Ambassador James Spain sent diplomatic notes to the U.S. stating that there was no reason to fret about any potential changes in Turkey's defense or foreign policies and that he "knows the military leaders well." BBC Turkish obtained this information after applying for the declassification of documents under the Right to Information Act in 2011. The documents obtained by British broadcaster are dated between Sept. 12 and Nov. 5, 1980, and reveal 10 conversations between U.S diplomatic representatives from Istanbul, Ankara and Izmir, representatives from other countries and the Department of State in Washington, D.C. The conversations that were signed by Spain have been shared with the public for the first time, BBC said in a piece published on Wednesday. One of the conversations of high-security classification carries a "Confidential" inscription, seven have a third-degree security classification with a "Private" inscription and two are marked as "Not Classified" because the information had previously been made public. According to BBC, it appears that some information was removed from the documents by the Department of State before being made public. Documents show a reply by the American envoy to one of the correspondence letters with the title, "U.S.-Turkey relations post-coup." "We know all of the military leaders quite well and we do not need to have any concerns as to whether any changes will happen regarding their NATO membership, Turkey's security or to any foreign policies," the note said. "Our real issue here is to protect our interests in a fast and effective way in the newly established setting." "What is more important in these first few days is our manner in front of the public," the document said, adding that they recommended keeping any statements limited regarding doubts as to whether any changes would happen. The beginning of the paragraphs in the correspondence letters regarding Spain's reviews of military leaders appeared to have been removed by the Department of State before the documents were made public. Considered a disgrace to the history of Turkish democracy, the Sept. 12 coup toppled the coalition government of Süleyman Demirel and dismissed the Turkish Grand National Assembly (TBMM). It marked the third time the Turkish Armed Forces took over a democratically-elected government and declared a state of emergency, in which thousands of people were unlawfully detained and even tortured to death. In the aftermath of the coup, the constitution was suspended and political parties were closed while their leaders were questioned, prosecuted and imprisoned.